September 20th-29th is National Deaf Dog Awareness Week. The thought of living with or adopting a deaf dog can seem a bit daunting, but the truth is, living with a dog that is deaf is not all that different from living with any other dog. Of course, there are changes that you will need to make in your daily interactions, but once you and your dog know how to communicate with one another, you can lead a normal, happy life together! Congenital deafness, or deafness due to genetic defects, has been found in about 80 breeds of dogs (but may be found in any breed). 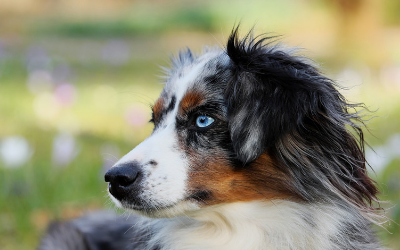 The breeds more susceptible to congenital deafness include Australian Shepherds, Dalmatians, Great Danes, and Welsh Corgis. Deafness and hearing impairment is most commonly due to injury to the ear from infections or trauma and the changes that accompany aging. Temporary or partial hearing loss can occur if there is wax build-up in the ear canals. Puppies that are born deaf may be slow to learn their names or commands. Dogs that become deaf usually gradually become less responsive – this is the first clue! Maybe he doesn’t come running when you arrive home or doesn’t come when you pull out the leash and call him for his walk. To determine if your dog may be losing his hearing, simply test your dog’s hearing by squeaking a toy, rattling keys, or whistling when your dog cannot see the source of the noise. If your dog does not respond, chances are he has some degree of hearing loss. Dogs are smart and old dogs can learn new tricks! To train a deaf or hearing-impaired dog, it’s helpful to replace verbal (or spoken) cues with visual cues. Start with American Sign Language (ASL), or some modification of ASL for hand signals. Be consistent with the signals that you choose and make sure everyone in the family knows the signals for each command. Use positive reinforcement to reward desired behaviors – use treats, affection, and toys. Be patient! Whether your dog is a hearing-intact or hearing-impaired, training takes time. It is important to remember that your dog can’t hear! While this may seem obvious, it is easy to forget in the heat of the moment when your dog is riffling through the garbage! Never let your dog off leash unless the area is fenced. Your dog won’t hear your calls as he heads towards traffic or catches the scent of a squirrel, rabbit, or cat. Don’t sneak up on him. He won’t hear you coming, and repeated startling could lead to stress and anxiety problems. Warn him that you are entering the room by turning the lights on and off or stamping your foot to create vibrations when he’s asleep on the floor. Attach an alert to your dog’s collar to indicate that he is deaf. Life with a deaf or hearing-impaired dog needs only a few adjustments to help him (and you!) live a more comfortable, stress-free life, and the rewards of your efforts will be long-lasting!